Lightning is a natural phenomenon that most people do not fully understand. Its magnitude and force is so great that it has the potential to cause devastating destruction, bringing damage to infrastructure, livelihoods and even life. Yet, it is something many people seem to underestimate and even disregard. 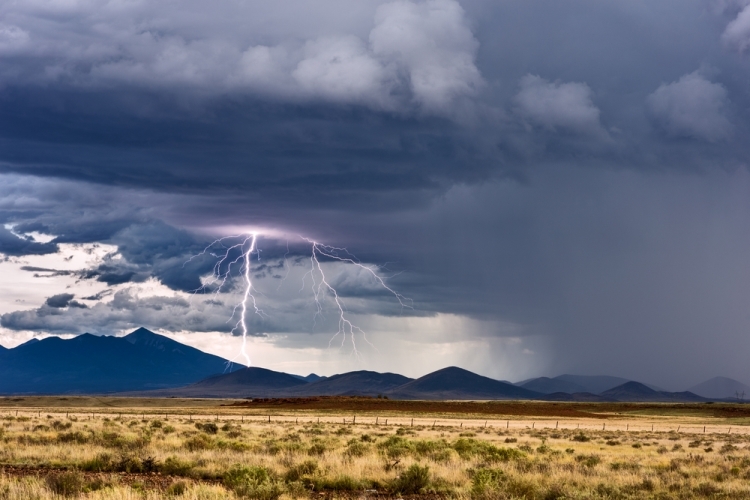 In South Africa, the Highveld region is showered with summer thunderstorms, with about 25 million ground flashes recorded in 2017, each of which is potentially lethal. A University of Pretoria lightning expert shares some valuable information to make us smarter and safer for next summer. Associate Professor in the Faculty of Health Sciences’ Department of Forensic Medicine, Prof Ryan Blumenthal is one of the few electropathology experts in the world. In his academic, research and advisory capacities, he is actively raising awareness about lightning and electricity and their risks, making communities across the world safer and more responsible in their decisions. Recently he was invited by the National Center of Forensic Medicine in Israel to give a lecture on lightning. Later this year he will be participating in the International Conference of Lightning Protection (ICLP) in Poland. The ICLP aims at promoting scientific research on lightning physics as well as methods for improving protection of people, animals and properties against the effects of lightning. Recognised for his expertise, Prof Blumenthal was also recently invited by the highly prestigious Academic Forensic Pathology Journal to compose a review article, titled ‘Lightning and the forensic pathologist’, exploring the pathology of lightning strikes, including the basic physics and mechanisms of injury. Lightning is non-discriminatory, but it is often poor people living in rural areas who feel the impact the most. For many people in developing countries like South Africa, walking is their main mode of transport to get to school and work. With this in mind, Prof Blumenthal says it is important that adequate provisions are made during the summer rainfall periods. In the Highveld, thunderstorms usually occur between 15:30 and 18:30. He advises that this should be considered by schools and employers, and work schedules should be adapted accordingly in summer to avoid people having to walk home during thunderstorms, putting themselves at risk of being struck by lightning. Prof Blumenthal played a role in the development of the South African Rugby Union guidelines for dealing with lightning, to ensure safety and responsibility are practised at all levels of rugby when a storm arises and a match is scheduled. He believes that decisions like this will highlight the severity of this natural force. ‘The inconvenience of stopping a game is less than the inconvenience of losing a player due to lightning,’ he says. Animals, humans, homes and other infrastructure are some of the targets of lightning, and Prof Blumenthal explains how lightning is dangerous to humans and animals. Lightning may also cause forest fires, house fires, explosions or objects to fall. The most common cause of death in a lightning-strike victim is cardiopulmonary arrest, and in Prof Blumenthal’s research he finds that about 75% of people who sustained cardiopulmonary arrest from lightning injuries died mainly because CPR was not attempted. Misconceptions and myths about lightning persist in South Africa. Some cultures believe that syringa trees attract lightning and some communities tend to cut down these trees. Others believe that if you wear rubber-sole running shoes you will be safe from lightning strikes. Prof Blumenthal says this is a completely false belief and that ‘lightning laughs at two inches of rubber’. Lightning revenge attacks are also an undiscussed and an unaddressed problem in South Africa, based on myths around lightning. Some cultures believe that if someone is killed by lightning, the lightning was sent by an enemy. The family will then take revenge and petrol bomb the so-called ‘sender’. ‘As a scientist, I want to teach people how to think critically about these things so that society can be a better and safer place,’ says Prof Blumenthal. He is doing everything in his power to ensure the safety of people the world over by providing greater knowledge and insight into lightning. This incredible natural phenomenon certainly is something that should be admired. As Prof Blumenthal says, people spend a lot of money travelling to the Northern Hemisphere to see the Northern Lights, yet there is nothing more dramatic and evocative than a South African Highveld thunderstorm.